Kristina sent me a Yummylicious Serum for my skin type - sensitive and dry. 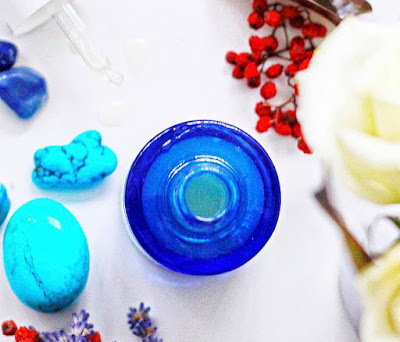 This serum comes in the most beautiful blue glass bottle I ever seen, the bottle is made in Italy and the serum doesn't have a fancy box or any other packaging because Kristina wants to be gentle to the planet and she doesn't want to create left over waste with her product. I love how she thinks and the simplicity behind her beautiful product! 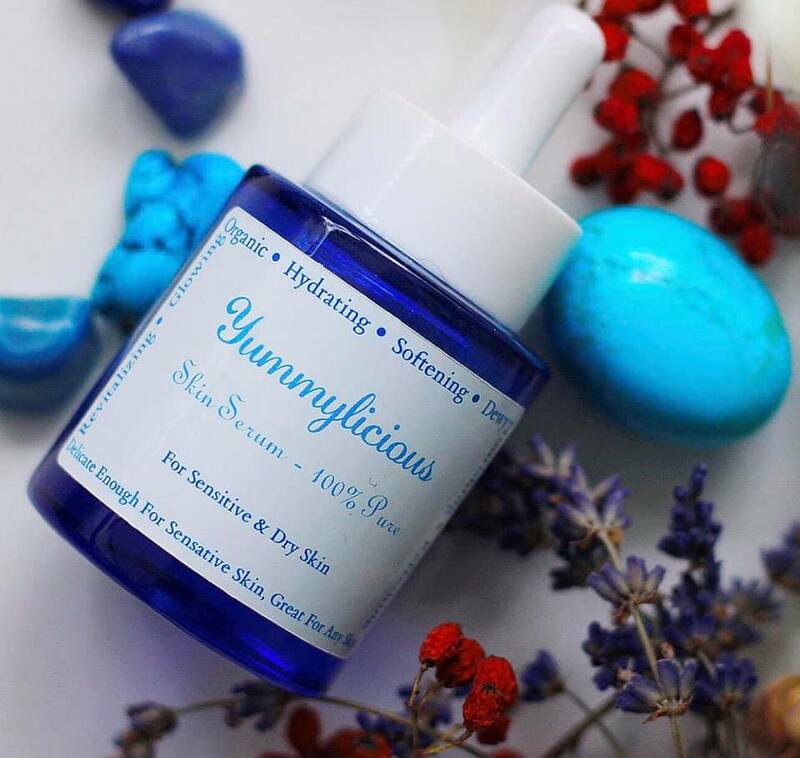 Like I mentioned above, Yummylicious serums are all hand made with organic, premium and pure ingredients, environmental friendly, vegan and cruelty free. They don't use any chemicals whatsoever, not even solvents, preservatives or stabilizers. 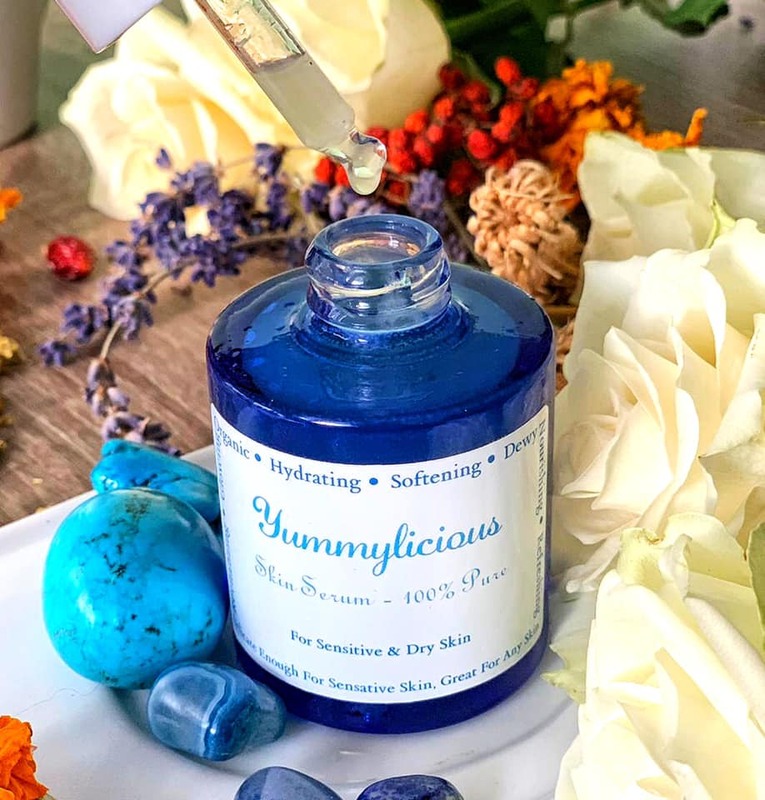 My Yummylicious serum is a beautiful blend of organic, pure oils (Argan Oil, Jojoba Oil, Grape Seeds Oil and Rosehip Oil) with Collagen and a cocktail of vitamins (A,B,C,D,F ) and Lavender, Lemon and Chammomile extract. Because of the Lavender this serum smells very pleasant and calming. This serum feels like skin food, its deeply nourishing and soothing. Despite the fact that this is not a water based serum but an oil based serum, the texture is incredibly light and silky, it simply melts on your skin and gets absorbed almost instantly. There is no sticky film or residue on my skin after using the serum, and also no oiliness. I absolutely love that feeling of free happy skin, super moisturized, hydrated and comfortable without layers and layers of creams and balms. If you struggle with dry skin you probably know what I am talking about here and you should check up this serum. I find this serum very concentrated, with just a few drops I brought my skin back to life. During winter my skin is constantly dull, tired, lifeless, dry and uncomfortable. Even if I do have plenty other serums and oils, Yummylicious does stand out, its a fabulous serum and quite a "beauty cocktail"! Makeup looks beautiful when I prep my skin with this serum, and whenever I want a dewy finish I mix a small drop of Yummylicious serum in my foundation, and there it is the perfect healthy glow without the use of any additional highlighters. Overnight I got supple, softer skin. With every application my skin got more healthy, less dry and more hydrated. For me, Yummylicious serum is a real beauty boost. If you don't have a serum in your skin care regimen and you are looking for something that can revive your skin and help you maintain a youthful healthy look, I truly recommend with all my heart and confidence the serums made by Kristina. Based on your skin type and your skin concerns, Kristina can create a custom Yummylicious serum just for you. What do you think about that ? I find it brilliant! And to show you how amazing is this lady, you need to know that with every bottle of Yummylicious serum sold, Kristina and her team will donate $3 to a charity! They support Samrong Children's Farm in Cambodia, Promethee Humanitaire in France and Maine Children's Home for Little Wanderers in the US. ******** This product was gifted to my by Yummylicious Serums team for review purpose. Sounds like a great product and its wonderful that they donate to such great causes! I think the same,they have all my admiration because of helping others. sounds wonderful and it is vegan and organic .. Sounds like a wonderful serum! So organic and good for the body! I always go for organic even if is not food. I have many friends that use some type of oil and they love it. How fantastic to donate to a charity too!! I may have to check this out! There are so many oils that mimic the natural skin oils,this is why a lot of times oils are more moisturizing and nourishing than regular moisturizers. This serum sounds great - would love to give it a go! I love the name and the ethos behind it. They have a really cute and unusual name for a serum, but I also like it a lot. This is interesting and happy to know that they're also supporting charity with this project. Would love to try this. Do you think they would ship internationally? Yes I think they do ship internationally,but you should take a look at their webshop to see what are the shipping costs. This serum looks like a great product. I don't currently use any beauty products like this, but this looks like something I could try. I am sure you will love it once you try it. Alfonzo,glad to hear! Thank you for your time. The serum seems to be very appealing. The name is definitely attention grabbing & it’s affiliation to charity is a bonus. Nice one! The fact that they give back to charity was very important to me.I am really happy to support a cosmetic brand that is not self centered.They care about the environment and they also care about others! This is the first I've heard of Yummylicious Serum. It sounds like a moisturizer I need to try. My Skin is so dry and needs this hydration. I love the fat that this product is organic and is made with premium and pure ingredients. Nice Post..!! Thanks for Sharing. Enjoy your full body massage in Delhi.